Whether you swim, run, play golf, tennis or rugby, your fundamental movement needs are specie specific and not sport specific. On this foundation of natural movement ability, movement efficiency and sport specific skills can be optimally developed. 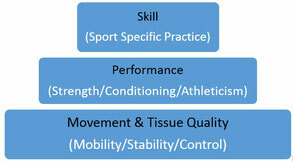 The Optimal Performance Pyramid (on the right) demonstrates this well. When this base of functional movement competency has been compromised, your ability to develop movement efficiency and skill will always be limited, and your risk of injury increases. Our bodies are designed to move in harmony, with every part working in synergy with the whole to create efficient and economic movement patterns. However, due to previous injury, poor postural habits, unbalanced training programs, over-training or lifestyle stressors, our bodies develop adhesion or fibrosis in myofascial tissue which are chronically overworked. These weakened or shortened fibers then result in imbalances of stability and mobility, and decreased proprioception around the adjacent joint, leading to the adoption of compromised movement patterns. The longer the body is forced to function in this state of imbalance, impaired neural communication, and inauthentic stabilization, the bigger the effects of overuse, the greater the energy leaks (lack of movement efficiency), and the higher the risk of injury. At Movement & Performance our first priority is therefore to evaluate your fundamental movement patterns (movement competency). As Certified Functional Movement Specialist, I make use of the FMS (the most innovative and reliable tool for movement evaluation internationally available), to accurately identify weak-links or movement pattern dysfunctions causative of poor performance and recurring injury. Based on your FMS data, a highly individualized training program is then designed to address your fundamental movement weaknesses. 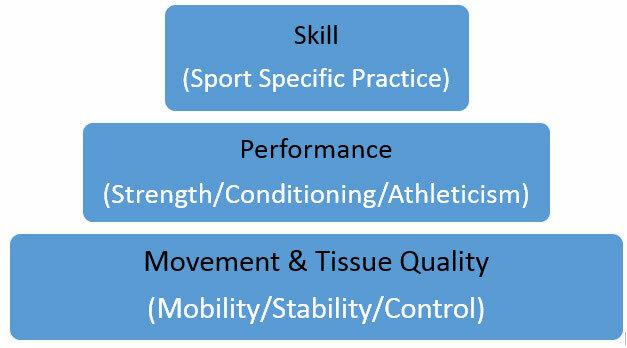 We follow a systematic approach in restoring a solid athletic foundation of movement, on which optimal and sustainable performance and sport specific skills can be developed. This is achieved through functional movement-pattern-focused training, filled with rich sensory stimulation to enhance the motor learning experience. What makes my system of work very unique is the fact that every step of progression is guided by how your body responds to the training load and volume. This is achieved through an integration of soft tissue preparation and exercise around the specific goals of the day. 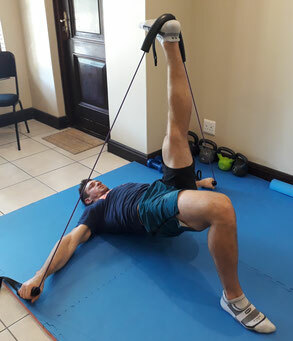 For example, we might do some manual soft tissue work inside a training session to address a particular limitation which surfaced in a exercise, and then return to the training floor to re-check the movement pattern. To summarize, your training program is always build around your individual specific needs, and not the other way around. That is the only way to sustainable optimal performance. Kobus has 18 years experience of working with sportsmen and women, from all sporting codes, ranging from international rugby players, professional soccer players, high school sprinters, national martial artists, hockey players, tri-athletes, cyclists, golfers, to weekend tennis players. As X-provincial rugby player, he knows what it takes to perform at your best. Let him help you be the best you can be!